One of my earliest purchases was the Assault on Black Reach boxed set - some marines, some termies and most of all - a dreadnought. Brother Stumpy was named after a few early battles in which he would start in my backline and waddle slowly forward, struggling to get into melta range. Poor brother Stumpy. 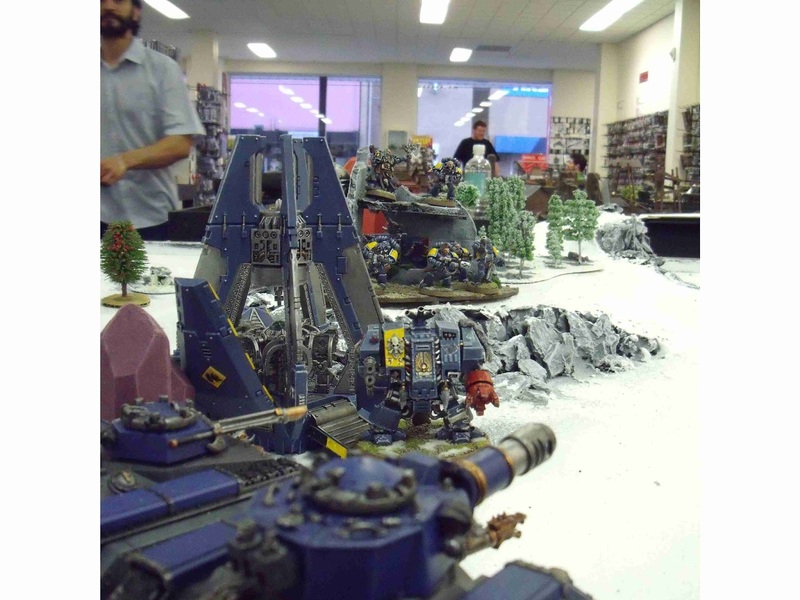 Then Brother Stumpy got a drop pod, and was the terror of my opponents IG backline, such as here in a pic from a battle back in 2010 at the Battle Bunker in Melbourne. Then my opponent started bubblewrapping, and Stumpy would pod down, waddle forward, flame a few cheap guardsmen and then get exploded by melta vets in a chimera. Poor brother Stumpy. So Brother Stumpy went back into stasis in The Fang, slumbering away the years. And then, with the release of the 7th Edition Space Wolf Codex, the bezerker dread was born. And I wanted one, oh yes my precious. But not enough to pay for it - I had 2 dreads already (Stumpy and Bjorn) who barely saw the light of battlefield, so no shiny new purchase for me. I was finally able to pick up some arms, blizzard shield and ginormous axe from ebay - the axe is a beast. Ridiculously large, the frost axe wielding dreadnought is purest undiluted Games Workshop silliness. And so Brother Stumpy becomes Venerable Brother Stumpy. But not quite. With a shiny new set of arms and alot of googling, allegedly the norse for "stumpy" is "Lodinn". And so Venerable Brother Lodinn strides forth from the Fang in time for Dreadtober. Next week, I'll either return to my 2nd Edition orks, or maybe possibly get another battle report done - from a game versus a pure Tyranid list.